Ontario is a hub for small business innovation and for design. 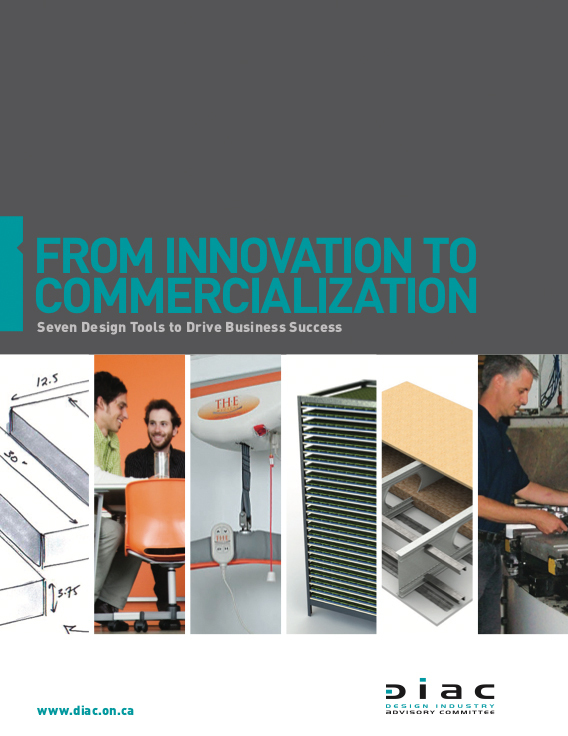 But there was no infrastructure to connect innovation-focused entrepreneurs to designers to improve commercialization success. That is why DIAC launched the Design Advisory Service (DAS) in 2009. The program is supported by the National Research Council’s Industrial Research Assistance Program (IRAP). The program provides a limited number of qualifying companies with a design audit and a one week strategic design project led by a senior designer from one of the six design disciplines (industrial, interior, graphic and fashion design, architecture and landscape architecture). The Design Advisory Service team supervises the projects and documents the process and the results in a series of case studies. For further information about the Design Advisory Service please contact: strategy@diac.on.ca. The Aurelle portable toothbrush is ideal for brushing away from home. But the company needs to upgrade packaging to reach mass market retailers. Transferring OEM capability to own brand products can create sustainable advantage. Solar and green roof installations are placing stress on the traditional roof but Bothwell-Accurate has a solution. Kids costumes build self-esteem while company builds growth. The presence of cameras in consumer electronics paves the way for new ways to communicate with hand gestures. The skills of designers from various disciplines are needed to develop adaptable living spaces for our aging population. Designing an Informed Marketing Pitch for Innovative Building Technology. Many green technology entrepreneurs find it difficult to demonstrate the value of their innovations at an early stage. The Morgan brothers faced this challenge twice! A third tier automotive supplier ponders the question: what else can we make? Protek Paints can own a white space in its market sector (not being addressed by larger competitors). Education and training series can reinforce market leadership positioning. As a supplier of dash-trim kits, Sherwood Innovations must adapt to frequent changes in automotive design and consumer tastes. The inventor of an ingenious moss tile planting system faces challenges in bringing the innovation to market. For niche manufacturers in Ontario, a strategic design approach is just as important to marketing and distribution as it is to new product development. Like many technology startups, XYZ Interactive wants to demonstrate a compelling application to attract licensees. Design Research can help to develop a multi-faceted approach to countering drug-induced sexual assault.